Clear Channel Communities, the community engagement brand of Clear Channel Media and Entertainment, and Power 99 FM, Philadelphia’s Hip Hop and R&B radio station, has announced the dates for its annual Peace on the Street Jams, a series of antiviolence activities designed to promote peace and provide communities with the necessary resources to prevent violence. The first of the 2014 summer series will be held on Thursday, June 26 from 3 – 8 p.m. at Great Plaza at Penns Landing in Philadelphia, and will feature artists Ca$h Out, Mack Wilds, Anthony Lewis, and MPrynt. The event series includes live music, spoken word and a performance by Power 99’s own dance group The Power Squad. Local businesses that participate continue to show support for non-violent communities by supporting Peace on the Street Jams. Participating businesses include Utz, Gift of Life, 1 Unique Hair and Beauty Supplies and Pacifico Auto. · Ca$h Out is a Georgia raised rapper who was signed to L.A. Reid’s Epic Records in 2012. Some of his hit singles include “Cashin’ Out,” “Another Country” featuring Future, and most recently “She Twerkin.” Ca$h Out has also collaborated with Fabolous, Yo Gotti and Da Brat. His debut album, Patience, will be released sometime this year. · Mack Wilds is a Grammy-nominated recording artist who rose to musical fame after releasing his hit single “Own It” during summer 2013. Wilds’ single has since been remixed by prominent rappers such as Lil’ Wayne, Rick Ross and Ludacris. His debut album, New York: A Love Story scored him a Grammy Nomination for Best Urban Contemporary Album. · Anthony Lewis is a new artist who was discovered on Youtube. His remake of the 1994 R&B hit “Candy Rain” has reached No. 32 on the Urban chart. His debut album will be released later this year. · MPrynt is an up-and-coming four-member R&B group from Philadelphia, PA. The group is signed to Motown and they’re known for their classic soulful harmonies reminiscent of great R&B groups such as Boys II Men. Admission to Peace on the Street is free. 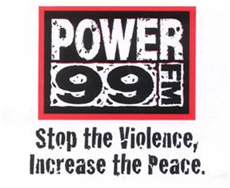 To learn more about Power 99 FM’S Peace on the Street, visit www.power99.com and follow the station on twitter @Power99Philly. Fans can listen to Power 99 FM on the station’s website www.power99.com, and oniHeartRadio. iHeartRadio delivers everything listeners want in one free, fully-integrated service: instant access to more than 1,500 of the nation's most popular live broadcast and digital-only radio stations from 150 cities, plus user-created custom stations inspired by favorite artists and songs. iHeartRadio also offers listeners a "Perfect For" feature which allows users to choose from thousands of curated stations based on a range of moods and activities. New - iHeartRadio Talk feature offers on-demand listener-created talk content alongside popular news, celebrity and entertainment “audiosodes.” iHeartRadio Talk also features “Daily Pulse,” a customizable Talk channel featuring the most up-to-date news and culture highlights, to which users can add or remove content that is most important to them.